Home Companies GoldAriel Magnetic Electronic (Shanghai) Co,. Ltd. Address: #2F, 9th building, No. 202, ZhenYe Rd., DongJing, SongJiang, Shanghai city, China, 201619. 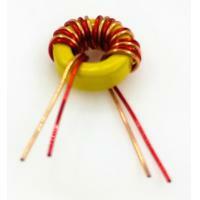 Toroidal inductors can be used in any inductor application that can accommodate its shape. Although usable, toroidal inductors are not always practical for some applications. Gapped toroidal inductors usually require that the gap be filled with some type of insulating material to facilitate the winding process. This is an extra expense. Powdered cores have an effective distributed gap. These are usually preferred over a filled gap because of lower cost and reduced gap losses. Some printed circuit boards are space critical. Mounting a toroidal inductor flat on the board may take up too much precious board area. Some applications also have restricted height so the toroidal inductor cannot be mounted vertically. Butler Winding can make (and has made) toroidal inductors (and transformers) in a wide variety of materials and sizes. Butler Winding also does “bobbin wound” and “tube wound” inductors. Our upper limits are 40 pounds of weight and 2 kilowatts of power. We have experience with foil windings, litz wire windings, and perfect layering. For toroids, we can (and have done) sector winding, progressive winding, bank winding, and progressive bank winding. Butler winding has a variety of winding machines, bobbin/tube and toroid. That includes two programmable automated machines and a taping machine for toroids. Butler Winding has vacuum chamber(s) for vacuum impregnation and can also encapsulate. To ensure quality, Butler Winding purchased two programmable automated testing machines. Most of our production is 100% tested on these machines. * Prevention of noise emitted from other components. A: You are welcome to get some samples before ordering. For sample, the estimated time is 5-7 days. A: We have responsible internal QC team to check all products before shipping. You can trust our quality is top notch. Customers are welcome to come to check their goods before submitting final payment. Q: How is the customized design? A: We are able to design wide kinds of applications based on the client's requirements. We can proof the original design, fix the design to meet the expectation or even design from an imagination, and then send clients the proof for confirmation before producing.